Please immediately discontinue the use of the Safariland Holster 7390. A problem has been identified when holstering the weapon. 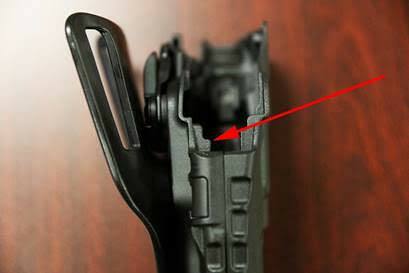 During the holstering procedure, it is possible for a small piece of the holster, located internally (pictured below), to catch the tip of the trigger and move it towards the rear. While we do not believe it possible for the trigger to travel far enough to cause the weapon to fire, such movement clearly should not occur at all. Safariland has been notified of the problem and is actively working on a solution. Please advise your personnel to immediately discontinue the use of this holster and return to the holster that they were using prior to the 7390.